Thousands of people travel daily between two major cities in Maharashtra, Nashik and Mumbai. Both cities are well connected via road as well as train and distance between them is approximately 180km. One of the popular travel options for frequent travelers is by using Kasara local train service. 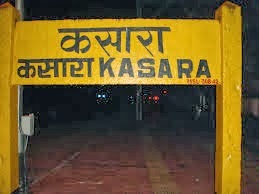 Kasara is the end point of Mumbai local train network towards Nashik. People travel till Kasara by road from Nashik either by using share taxi service or Maharashtra state transport bus service. From Kasara onward local train service is available to conveniently reach desire location on Mumbai Central Railway network. Distance between Nashik and Kasara is 62km taking approximately 60-70 minutes by road while Kasara to Mumbai CST is 121km needing 140 to 165 minutes. Fare between Nashik and Kasara is in the range of Rs.80 to Rs. 100. The local rail link between Kasara and Mumbai CST 121km long consisting 35 stations. Stations like Asangaon, Titwala, Kalyan, Dombivali, Thane, Ghatkopar, Kurla, Dadar and Byculla are major stations where “FAST” trains stop while “SLOW” trains stops at all stations. “MEDIUM” trains stops at major stations till Kalyan from Mumbai CST and from Kalyan onwards till Kasara at all stations. Travel time between Kasara and Mumbai CST is in the range of 140 minutes to 165 minutes depending on the service. Train fare is Rs.40 for “second class” and Rs.210 for “first class”.